From the family of berries, red raspberry is a widely eaten fruit that has many medicinal properties. Being described for its therapeutic use in 1597 in the book “ The Herbal”, the raspberry leaf and fruit have been used ever since in various medicines. With it being prominently used in various medicines, the raspberry leaf tea has become popularized remedy for various medical conditions and disorders. The red raspberry leaf tea is used for curing and preventing the following disorders. Raspberry is effective in treating various stomach ailments. It reduces stomach cramps and being anti-inflammatory it helps heal internal illness and stimulates the blood circulation in the Gastrointestinal (GI) tract. It cures diarrhea and other ulcers in the digestive system. It is used to alleviate all cold symptoms and is also effective in treating both flu and swine flu. It is also used in treatment of sore throat and cold sores. Red raspberry has many anti-oxidants in it , the most important being the Ellagic acid. The Berry Health Benefits Network confirms that the tests performed at the Medical University of South Carolina’s Hollings Cancer Center showed that human body absorbs the ellagic acid easily which helps in killing cells in a few kind of cancers. It has been found the most effective in treating esophageal, tongue, lung, colon, liver, skin and breast cancer. 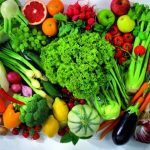 Being high in vitamins like Vitamin A, B, C and E, it is considered as one of the best resource for these vitamins. 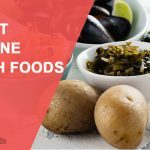 Not only vitamins, it consists of potassium, calcium, phosphorous and more. These vitamins and elements helps in fulfilling the body’s requirement of vitamins. Vitamin C , Phytonutrients and Gallic acid present in the red raspberry have been effective in protecting the heart, thus slowing down the advancement of age related diseases. Raspberry has all the above mentioned benefits due to the presence of various vitamins and anti-oxidant properties. It helps in relaxing blood vessels and muscles depending on the dose and muscle involved. Hence due to this property of raspberry, a lot of women have opted raspberry leaf tea for easing labor and delivery. 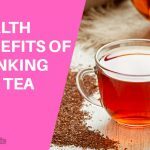 To give all you ladies a deep insight into how effective is raspberry leaf tea for women health, we have listed some major facts and figures for you to know. Have a look! Consuming red raspberry leaf tea during pregnancy is an age old tradition that has proven to be effective in inducing a smooth labor for quite a few women. Mentioned below are some major benefits of drinking red raspberry leaf tea during pregnancy and post pregnancy. It is known for balancing hormones, hence it can naturally cope up with any hormonal imbalance during pregnancy. It is effective in decreasing the length of labor, hence refraining mothers from getting tired during the pregnancy. It helps strengthen and tone uterusto overcome and stress from the changes happening in the body and hence enhancing the uterus as a protective shield for the baby, throughout the pregnancy. Post pregnancy it helps tightening the uterus and brings it to its normal size. Raspberry leaf tea has been effective throughout various stages of pregnancy. With its ability to tone and strengthen the uterus, it helps overcome the discomforts a woman faces while carrying a baby inside the womb. It helps in relieving symptoms of pregnancies that helps all mothers to be relax. It is extremely effective in decreasing nausea and relieving constipation. As it promotes blood circulation, it is also effective in preventing miscarriages. Post pregnancy the intake of tea, has shown improved milk production in mothers, improving the complete lactating health. A lot of women prefer consuming the red raspberry leaf tea as it is said to ease the labor pain and helps in an easier and quicker delivery. 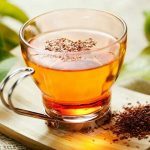 Due to this a lot of women opt for this tea as the need of C-Section, vacuum birth or the use of forceps for delivering the baby can be avoided until unless medically required. 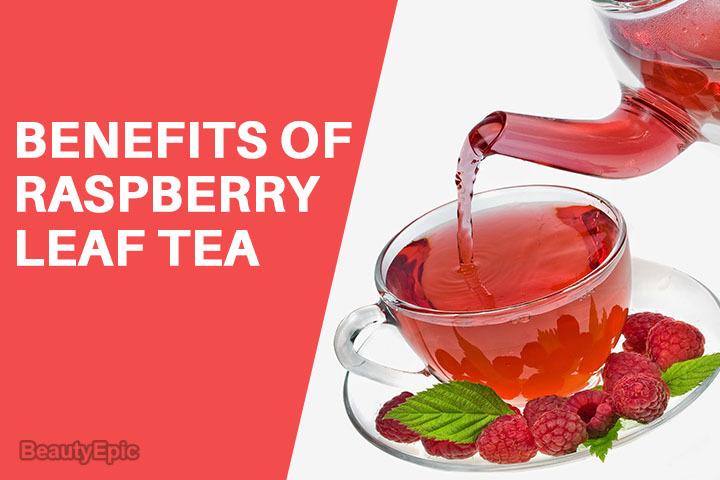 Raspberry tea also promotes bone development of the baby and helps in its growth. With this we wind up with the benefits of consuming the red raspberry leaf tea during pregnancy. Now that you all would-be mothers would want to know, how do we prepare this magical tea, we have mentioned the recipe here for you. Try it out. Now mix all these ingredients well and store in an air tight jar. One could churn it too before storing, if they prefect tea dust more. To make yourself a cup of red raspberry leaf tea, take 8 ounces of water and bring it to boiling state. While it boils mix 1 tablespoon of the mixture and let it steep for 5 minutes. Sip it once its lukewarm. It can be consumed multiple times in a day, however excessive of drink 7 to 8 glasses should be avoided. If one likes to sip in cold tea, then can strain out the herbs post steeping and store it on an air tight glass jar and refrigerate. One can consume it as cold as desired. 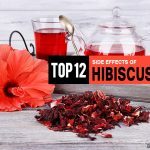 One can consume the tea with out the other herbs mixed, however adding them enhances the tea and adds more vitamins and elements to the raspberry tea. Like alfalfa adds magnesium, calcium, iron, silicon, potassium vitamins E , C and K. These vitamins play a major role in blood clotting hence preventing any hemorrhage during child birth. Nettle adds to the anti-inflammatory, immune boosting and digestions properties of the tea. And finally mixing dandelion leaf helps in normalizing the blood pressure as well as improves the digestive and urinary health during pregnancy. 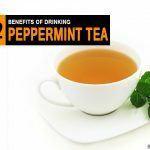 Compared to the benefits of the tea, there are fewer adverse / side effects one needs to consider while consuming it for a span of time. Listed are the side effects of the red raspberry leaf tea. 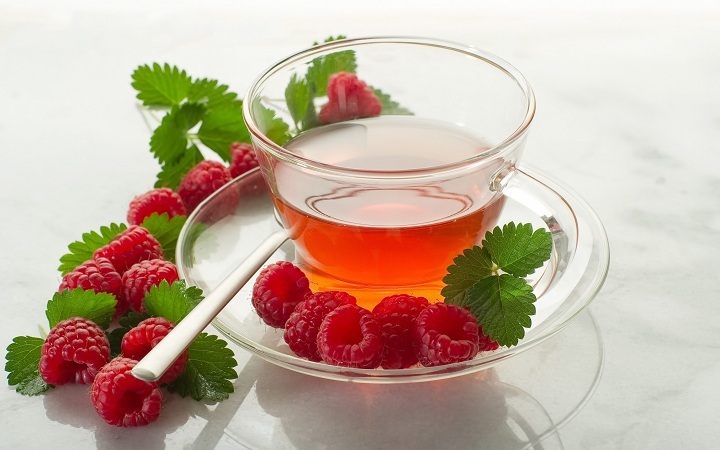 Any suffering from any hormone sensitive condition like cancer in the breast, uterine and ovaries should avoid raspberry tea as the red raspberry might act like estrogen. And this exposure can be harmful to the individual. Ones suffering from endometriosis and uterine fibroids should avoid the tea. So ladies, you can now incorporate the tea in your daily diet regime if you are looking at giving your body another source of anti oxidant and vitamins. If you are skeptical about the dosage of raspberry during pregnancy, we would suggest having a medical consultation regarding the same to avoid any health complication. Have a good time sipping the tea ladies!